Summer is almost here, and we’re in for a good trio of sunny #MetaBeers sessions, all booked in at the Yorkshire Grey. 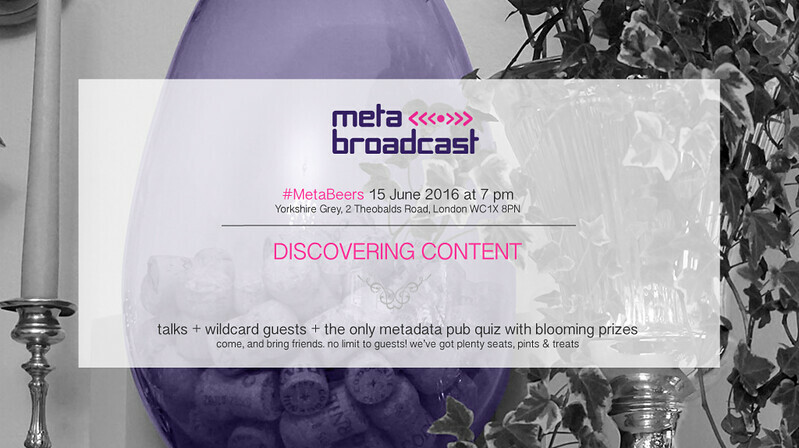 In May lots of people stepped up to talk about their own experiences with metadata, and we were treated to the only metadata pub quiz with floral prizes, and excellent food and drink. The next date for your diary (as advertised in our newsletter) is Wednesday 15 June from 6:30pm for a 7pm start. We’ll be talking about our own experiences of finding content. Join us! This is all follows on from May where we talked about metadata and me. Every talk offered a fairly unique perspective on each person’s relationship with video and audio data. next time: what about july? Looking further into the future, in August TV will be dominated by the Olympics, those 2 weeks in every 4 years where a significant part of the world comes together to watch live a set of mostly otherwise minority sports. #MetaBeers will be right in the middle of it. We’ll watch some, talk some, and discuss what can be learned for the other 206 weeks of each 4 year Olympic cycle. But that’s still a way away. For now, please do join us on Wednesday, June 15th. voila a-z: b is for buzz!